Baby Christine is my cousin Stella's daughter, she is really adorable. When I was asked to make her first birthday, I was delighted! My cousin wanted a cake in the shape of a Number 1 and 50 cupcakes. After some discussion, we decided on vanilla Number 1 cake and chocolate cupcakes. I was given the go-ahead to design the cake and cupcakes as I desired, and the only criteria was that the cake fondant is to be lilac in colour and cupcake icing also lilac to match. 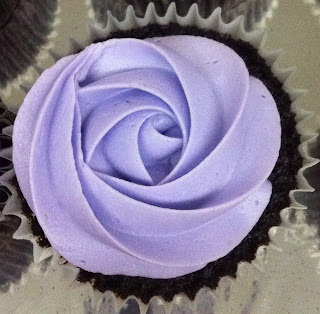 I enjoy making the icing swirl roses which I call the Baking Bees Perfect Swirl. Lovely cupcakes for Baby Christine. I made 4 designs which complemented the cake design. The 2 trays of completed cupcakes. C is for Christine! The Baking Bees signature fondant bees. Cute and absolutely adorable, don't you agree? also a floral border to complete the look. Lots and lots of pretty flowers for little Christine, in harmonious colours - purple, red and pink! The adorable birthday princess with her parents. Thank you, Arlene, for your kind words :) Really appreciate it!